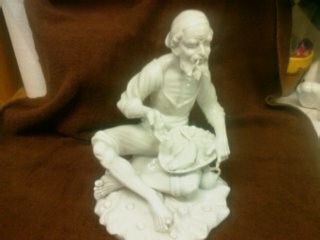 Oriental Porcelain Figure or is it European? 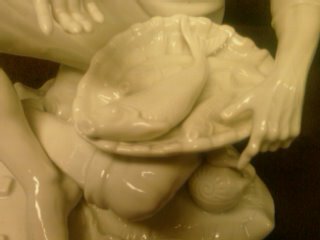 Seated chinaman with a basket of carp in his lap. Solid white glaze, 11.5in tall porcelain figure with under glaze cobalt blue three point crown and crossed swords under the crown. Picked the figure up at an estate sale. I have searched for hours on end & have gotten close but yet to find the exact makers mark. If someone out there could help me with this I would be willing to dance at your next wedding. Thank you for your information & time, I would be interested in knowing the value if you have any idea. he is beautiful. That is very interesting, thanks for your time. may I ask how much you paid for them? I would love to see the female version, you’re very fortunate to have found them, he is just amazing to me. My fisherman differs in 2 areas – The marking on mine says “Dresden Original Germany”. Your marking is a Dresden marking from another location. Mine are not glazed either just pure white. The original molds are believed to been destroyed in Eastern Germany. I have the exact same oriental porcelain figure. I purchased in Germany. It is made by Dresden. I also have the female version. Very interested in value? Based on the mark I doubt your figure is Oriental and it is more likely to be of European origin. the crown has a distinctly European quality to it. 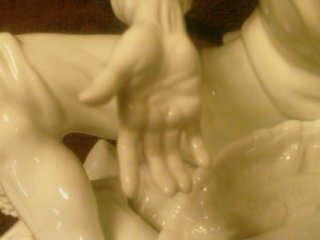 The photos aren’t too clear but the figure appears to be blanc-de-chine porcelain. Blanc-de-Chine is French for “Chinese white”, which is a European term describing a type of white Chinese porcelain made at Dehua in the Fujian province, otherwise known as Dehua porcelain. It was produced during the Ming Dynasty (1368 – 1644) up until the present day and large quantities arrived in Europe as Chinese Export Porcelain in the early 18th century. 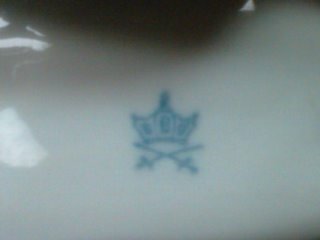 It was copied by Meissen and other ceramics manufacturers and it was also exported to Japan in large quantities. I would recommend reading – Blanc de Chine Porcelain from Dehua, by Ayers, J and Kerr, published by Art Media Resources.